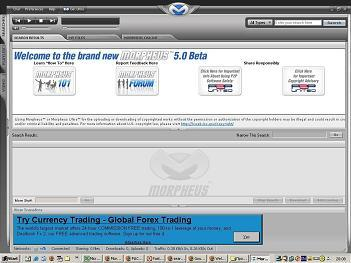 The new Morpheus 5.1 with BitTorrent support takes the most powerful file-sharing technology available today and adds great features including quick and easy audio and video exporting to iPods through iTunes, one-click CD burning and firewall-to-firewall transfers that increases the number of available files. The smart user interface makes it fun to search, discover, download and play all types of media files including MP3 audio, music, movies, videos, games, photos and documents. Search multiple P2P networks including the Neo Network, Gnutella and others to download more of what you find including rare and unique content you can't find anywhere else. Morpheus protects your privacy with access to public-proxy networks; works with your antivirus software; returns fast, multi-source downloads; provides Bitzi anti-spoofing lookups; and includes new community features and parental filters for safe downloads. Experience pure file-sharing with absolutely no spyware or 3rd party bundles.